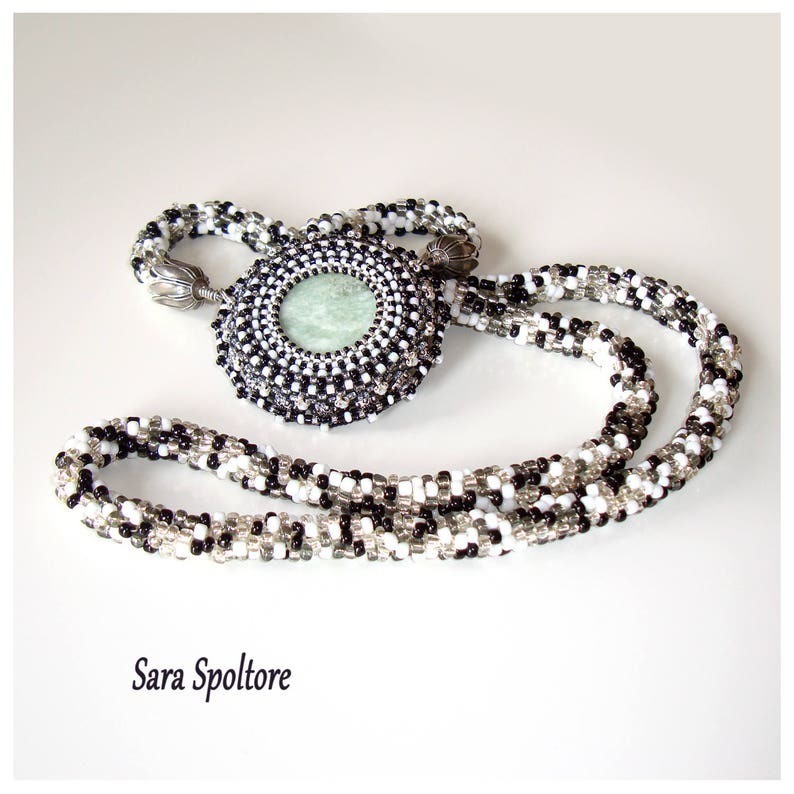 For the necklace, I have created a rope with crochet with a nice marble effect. The pendant in the middle of the necklace is a simple disc made of stone. I have bezeled this disc with several sizes of beads, spending many hours to see the beadwork completed. The whole necklace required two full days of work, a lot of passion and, of course, love, to be done. All the metal components I have used are nickel free. Beaded jewelry needs love so be carefull with it: don't spray any perfume on it, don't get a bath with it, don't let it fall on the ground because beads are made of glass and they can break down. When you don't wear it, keep it safe in a box. Since the high value of the necklace, it's not possible choosing the Standard Shipping for this item. I will send you the necklace by Registered mail and I will send you the tracking by email as soon as possible. Lovely cabs, well made with super fast delivery I would certainly purchase again and I look forward to getting creative with these. The colors are wonderful. Your creativity is inspiring! Wonderful. I love your work. Wish you had beadwork for sale. These are beautiful cabochons - they look like real mother of pearl! I currently only accept PayPal for payment. You don't need to have a paypal account to use this function, just press the Paypal option and follow the link: to pay by credit card. - If the item is shipped with Priority Air mail it is not possible to ask for a refund if the shipping is missing. Please keep in mind that the returning shipping costs are covered by the buyer and NOT by the seller. I ship everywhere from Italy. I use Priority Air mail or Registered Air mail (tracking number is available only for the Registered option). All items are sent 1- 3 days after I receive payment (excluding weekends and public holidays). The buyers are responsible for any and all duties and customs charges that may be incurred. I ship to your Etsy address unless you specify otherwise. All my items are packed in bubble wrap to insure maximum protection! Like other clay based products, polymer clay jewelry can break or crack if dropped. Also it is better not to scratch them or bend them, as you might destroy them. Better avoid contact with water and don't take a shower while you wear the necklace or earrings. They have silver, gold plated, bronze fittings and they might get blackened. Although, the polymer clay itself is waterproof so some drops of water, rain won't hurt it. The fitting parts can be polished GENTLY with a damp cloth or a little brush.